Many tutorials explain how to reboot in Safe Mode. But they usually need you to already be in a Windows session for that. What if Windows doesn't start well anymore and the usual F8 doesn't work? Well, you can enable the classic Boot Menu via the Command Prompt of a Recovery Drive. 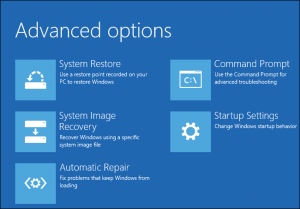 And Select "Create a Recovery Drive" (No need to back up system files to the recovery drive). Boot your other PC on that Key (depending on you BIOS, you can use F8, F12, ... to access to Device Boot Menu. See a list here). Select your Keyboard and enter the "Troubleshoot" Menu. Enter next the "Advanced Options" Menu. Notice that with this Windows Recovery Drive, you won't have the "Startup Settings" menu in the "Advanced Options". This one is only available when you reboot your PC with the "Advanced Startup" Options or when Windows failed to boot twice and enter the Repair mode automatically (NB. : You can obviously use that trick to access the Startup Settings and boot is Safe Mode: boot the PC and switch it off when Windows is starting). And shutdown completely before rebooting your PC. I am a big fan of Windows' search feature since Windows 7. So, I was really frustrated when searching stopped to work this morning on my Windows 10. Fortunately, I have been able to fix it easily by deleting a key of the registry. In the Task Manager, open the tab "Details"
In the Task Manager, open the menu File > Run new task, and type "Explorer"
Et voilà, the Search feature should now work fine again. Yes, this is possible. But you have to enable the support for «Bluetooth headphones» via a hidden menu. The hidden menu is now appearing on the screen. With the keys «up» and «down» you navigate between entries (submenus or settings). With the key «ok» (Enter) you enter a selected submenu or edit a setting. With the key «Return» you exit the submenu or the edit mode. With the keys «Left» and «Right» you change the value of a setting in edit mode. And now switch off the tv. Voilà. The feature should be enabled. To access it, switch on the tv and press the key Menu. Then go to > Sound > Speaker Settings > Bluetooth headphones. From there you can search for Bluetooth devices and pair them. Later, to reconnect a Bluetooth which is already paired, use the key «tools» and in «Speaker Select», pick «Bluetooth headset». If it does not connect immediately, switch off and on your headphone and retry changing the "Speaker Select". Notice that you must do this before starting any application like Plex or Netflix in the SmartHub. Find Drivers for an "unknown device"
The most difficult drivers to find are those for "unknown devices". Fortunately, there is a web site to search for those based on the device's "Hardware ID". It can be tricky... And here is the trick: disable the Secure Boot and use CSM Boot mode instead of UEFI. Once you don't need to boot from the key anymore, reset those settings. Press [F2] key to enter the BIOS Setup Menu. Press [F12] key to access the boot menu. I did need that to reinstall Windows 7 x64 SP1 on a old Toshiba as the CD/DVD reader is broken. Within Rufus, I did use a "MBR Partition Scheme for Bios or UEFI". Finally, I had issue to install Windows with the key connected on the USB 3.0 port (the one which is blue) : "A required CD/DVD driver is missing". I did solve that issue plugging the key on a USB 2.0 port and restarting the PC.